Let me say at the outset that from what I have seen of the occupation movement, it has becomes so dynamic, so energized and been met with such wide support among the people that nothing can defeat it if it doesn't defeat itself. However I fear that it is on the verge of doing just that. There is big trouble in the Hard Block Cafe! The Occupy Los Angeles General Assembly split into dueling factions Wednesday evening as a large number of occupiers who felt alienated by the highly structured, long and boring, but largely irrelevant GA , came in and took over the mike, overthrew the process, and made it an open mike session. The GA had been led by a facilitation committee that was far more concerned with process than content. This is a facilitation committee lead by a new core group. 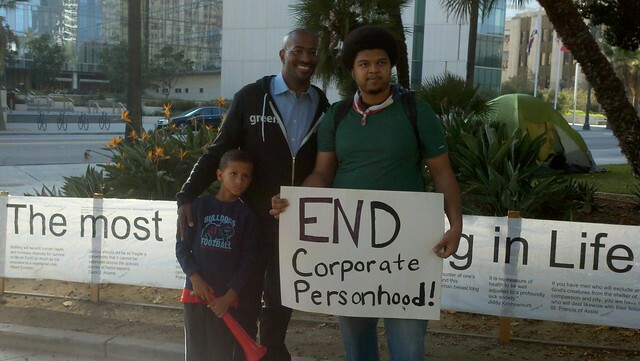 The original core group of facilitators that used the process to create Occupy Los Angeles have moved on to other areas. This may be "billed" as a leaderless movement but not only is there something to be said for leadership, there are a lot of advantages to consistent leadership, IMHO. The original Wednesday GA started on the south side of city hall with the solar stage. After it was overthrown, the facilitators, for a while, reconvened their GA on north stairs before returning to the open mike crowd on the south stairs in the spirit of unity. Even in Los Angeles, where city leaders have greeted the demonstrators warmly, there are signs of protest fatigue and increasing anxiety about what happens next. Los Angeles Mayor Antonio Villaraigosa, who earlier this month had ponchos distributed to rain-soaked Occupy L.A. protesters, said Wednesday that the encampment next to City Hall "cannot continue indefinitely." Villaraigosa has instructed city officials to draft a plan for another location for the demonstration. He decided the camp could not stay after Los Angeles County health inspectors expressed worries about the cleanliness of the camp, and because of concerns about the condition of the lawn and trees. After seeing the occupation grow to fill every green space around city hall as it approaches its one month anniversary, it is not surprising that the city and police are starting to look for reasons to evict the occupiers. That is not a problem. That is expected behavior. The problem is that more recently Occupy Los Angeles has allowed some real substance to creep into those charges and that endangers the public supports that are the barricades of this occupation. In an occupation, a group holds a space against an opposing force. Militarily speaking, the LAPD is a thousand times stronger than the protesters but this is not a military occupation. This is a non-violence occupation and it draws its strength from its moral authority and its public support. If it allows those pillars to be undermined, the occupation may be fatally weakened. Since it was established almost a month ago, the peace and publicity that have been created around Occupy Los Angeles has allowed it to attract a much wider audience than the activists that originally started it. Many are becoming politically active for the first time and most have contributed positively to the movement. But not all. Some have been attracted by the music, free food and festival atmosphere that has accompanied an encampment that hasn't felt the need to gird itself for a police attack. The problems that have developed in the past week include intimidation of women and others, drug and alcohol use, stealing, defecating in inappropriate places and making noise late at night. These rogue elements have been allowed a free reign because many of the occupiers don't believe in any rules or form of government and they don't believe in excluding anybody that is part of the 99%. Added to that is the consensus model decision making process where a single "hard block" can veto a decision. 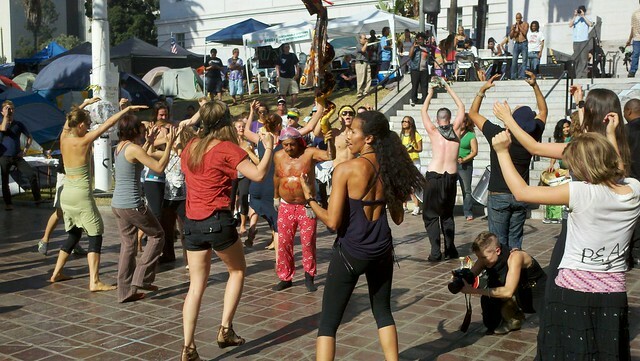 Occupy LA has also become the home of a strong party element that likes to play music and drums at all hours. Many of these occupiers aren't involved with the committees or other work of the occupation and less than half of the occupiers have been attending the general assembles. Part of the reason for that is the GA has failed to address the main problems facing the community. For example, the major discussion of the GA on Tuesday evening was an individual's proposal that Occupy LA reject work with the major political parties, a proposal that had already been discussed at three previous GA's. It is still not clear whether the point of that resolution is to make PDA or Ron Paul supporters feel unwelcome or to stake out a position in preparation for the next election, but that discussion went on for more than an hour, and the very serious problems Occupy LA now faces, and threaten it's very existence, were hardly mentioned. Neither were the events in Oakland that should serve as a reality check for those on the LA facilitation committee that have spent hours debating whether to allow three days to resolve a hard block, or four. Many Oaklanders support the goals of the national Occupy Wall Street movement. We maintained daily communication with the protesters in Oakland. However, over the last week it was apparent that neither the demonstrators nor the City could maintain safe or sanitary conditions, or control the ongoing vandalism. Frank Ogawa Plaza will continue to be open as a free speech area from 6 am to 10 pm. I don't know if there is any substance to the complaint that "neither the demonstrators nor the City could maintain safe or sanitary conditions." I am not in Oakland nor have I been paying attention. If there was some substance to them, then the demonstrators themselves have given the city the opportunity, no more, the obligation, to take back control of the space. I am in Los Angeles and I do know that the problem of "maintaining safe and sanitary conditions", along with problems associated with drug and alcohol use and excessive noise are gnawing problems for Occupy Los Angeles. If they are not controlled by the occupiers, the city council will come to regret their resolution of support, the LAPD will revert back to normal form as they gear up to clear the grounds around city hall, and the Committee to End Police Brutality at Occupy LA will get what they have longed for from the very beginning but so far have lacked, a real justification for their name. 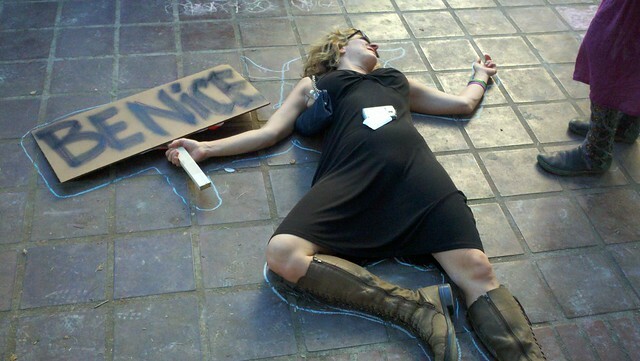 Some activist from Occupy LA don't believe in any rules at all. 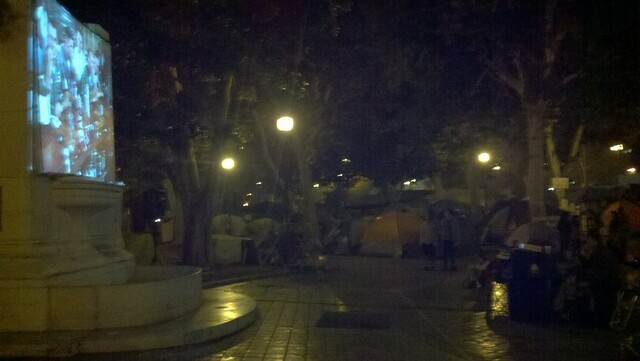 They respect neither city laws nor the consensus of Occupy Los Angeles as expressed by the general assembly. They are completely opposed to getting permits and even talking to the police. 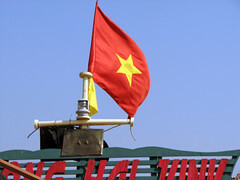 Some of their views are expressed on the website Unpermitted LA. There they complain about "the leadership of Occupy LA, especially concerning their collaboration with police" and similar concerns. They also call for the "Immediate dissolution of the Security Committee and recall of the current Police Liaisons." They see the Security Committee as acting as the police for Occupy LA and extensions of the LAPD, saying "The police liaisons currently are acting in the interests of the police rather than the movement and are not acting transparently." They cite an example "in one instance [security] went into the tents of comrades who intended to defy police and SC orders to move to the sidewalk, without their consent." This refers to what happened the very first night of Occupy Los Angeles on October 1st. The deal we had then negotiated with the LAPD and the GSPD, that controls the ground around city hall, was that we would not be arrested for being on the grass till 10:30pm but between then and 5am or so, we would have to move to the sidewalk or face sprinklers and arrest. That first night we had a limited number of tents, maybe 60, so a hundred or so campers staying overnight. I argued, as did others, that it was important that we comply with the police order at that time, not as a matter of principle but as a matter of tactics. 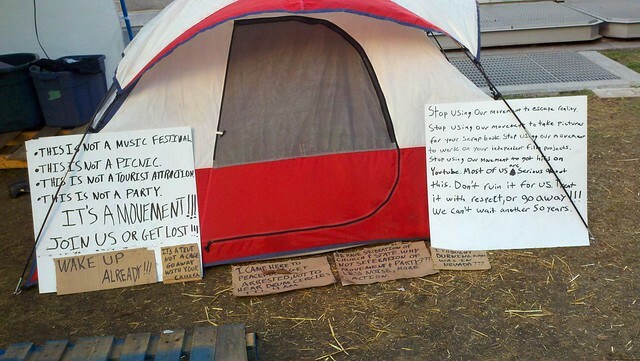 I said that when we had a thousand occupiers here, we could refuse to move the tents off the grass and make it stick, but if we refused to move them that first night, well, the morning news would have been all about the arrests, and possibly violence, and that would be a big set back. It's been almost two weeks now that we stopped moving the tents off the grass, just about the time the number of tents pasted two hundred, although the official police stance on this has not changed. During the second week of Occupy Los Angeles, the city council pasted a formal resolution of support, a very rare thing among the occupations. 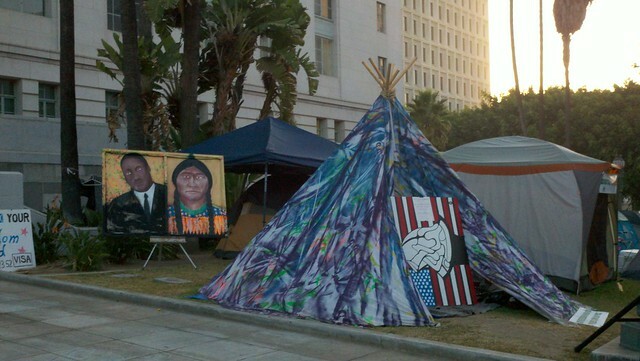 We have gone more than three weeks with no arrests at Occupy LA and no real problems about tents on the grass 24/7 except for the growing mummers above the costs of resowing the lawn. 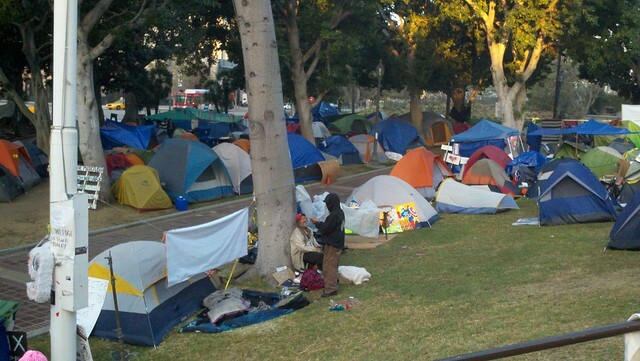 All of this has allowing for the tremendous growth and growing regional influence of Occupy Los Angeles but I believe all of this would have been jeopardize had protesters stayed on the grass that first night. I argued that we weren't here to protest park hours. We had bigger fish to fry. Fortunately the general assembly supported that view on the first night and the decision was made that we should end the meeting and move to the sidewalk by 10:30pm. However some individual anarchists disagreed and having failed to win the GA to their position, decided they would go rogue and defy everybody and keep their tents on the grass anyway. They stood on their individual "right" to refuse all governess and do whatever they could get away with. They were itching for confrontation with police and didn't mind destroying Occupy LA to get it. Whether these anarchist elements admit it or not, their views have come to support these rogue and party people that threat much of what has been accomplished so far. The fatal problem for the occupy movement is the view that no one can be excluded, even people who don't agree to follow the rules. If the main functional demand of the occupy movement is seen as the "right" to create lawless spaces in our cities, then they will lose most popular support and then they will be rolled up. This email was posted to the Higgins Building (Second & Main) list serve today, and I wanted to make you guys aware of it. We live on the south side of the building, so don't hear the stage from our unit, but others might and might call, as suggested. Curious as to whether it is true that the amplified stage is "rogue," and whether there is any way to control the level of sound so that it is more resident-friendly. Thanks for all that you are doing for all of us. Hey all - I know no one wants to be like "omg Occupy noise indefinitely?" Welp - I am and have learned a new thing through my research and talking to folks. There is a solar powered stage, the "noise/trouble makers" of Occupy - who Occupy LA actually do not align themselves with. And there apparently is tension and controversy about this rouge illegal stage. I've asked both Occupy and the Solar Stage to move thier stuff to Temple St.. OLA complied but Solar Stage has met with illogical and militant resistance. #1 it is illegal for any loud PA much less music and yelling over speakers - or even without a speaker system. #2 The Solar Stage are doing a disservice to the actual movement. So let's do this. Call the non-emergency number 877 275-5273 and tell them you are tired of hearing the Solar Panel "Power of Green LA" stage all day and night. Tell them it's a stage that Occupy has - in print - disassociated itself from. Tell them you know full well that their noise is against several city ordinances and that (whether you either support, or don't support the protest) - that Solar Power stage is illegal and a hostile stage and really needs to move to Temple St. or just get shut down. More power in numbers folks. Whether you support or don't support what's going on across the street. The OLA group wants to be good neighbors and are unable to deal with some pinkertons in their camp who don't want to be good neighbors. Occupy Los Angeles can't govern itself, through the general assembly or any other process, whether based on consensus or not, as long it accepts people who refuse any government at all, even self-government. And if Occupy Los Angeles can't govern itself, it will be dissolved by the capitalist government just waiting it's chance to end our occupation of this space. Ten hours before uniformed police officers had pledged to clear Zuccotti Park, Occupy Wall Street's home since its founding a few weeks ago, the demonstrators debated, discussed, voted on, blocked, formed consensus, blocked again, and then again formed consensus — about playing drums. This, the night before what many thought would be a defining moment for Occupy Wall Street and the protesters' attempts at a modern-day revolution, and hours before the 7 a.m. NYPD mandate to wipe Zuccotti Park clean of the movement's tents and signs and its pamphlets and purple-arm-banded protesters. But for 45 minutes, the most important issue was a proposal to limit drum circles. It seemed trivial. It seemed silly. It seemed like a waste of time, time that could be used to prepare for what seemed inevitable as the sun rose: mass arrests, chaos, possible violence, injuries. While the city eventually called off the “cleaning” early this morning, nobody knew that last night. While discussion of the impending police action on the movement's unofficial home did take place, most of debate revolved around what seemed to be a crucial decision about drum circles, even though it wasn't clear they'd have anywhere to drum the following day. When I left, after the General Assembly was adjourned, it was still unclear when they were going to drum. Friends, mediation with the drummers has been called off. It has gone on for more than 2 weeks and it has reached a dead end. The drummers formed a working group called Pulse and agreed to 2 hrs/day at times during the mediation, and more recently that changed to 4 hrs/day. It's my feeling that we may have a fighting chance with the community board if we could indeed limit drumming and loud instrumentation to 12-2pm and 4-6pm, however that isn't what's happening. Last night the drumming was near continuous until 10:30pm at night. Today it began again at 11am. The drummers are fighting amongst themselves, there is no cohesive group. There is one assemblage called Pulse that organized most of the drummers into a group and went to GA for formal recognition and with a proposal. Unfortunately there is one individual who is NOT a drummer but who claims to speak for the drummers who has been a deeply disruptive force, attacking the drumming rep during the GA and derailing his proposal, disrupting the community board meeting, as well as the OWS community relations meeting. She has also created strife and divisions within the POC caucus, calling many members who are not 'on her side' "Uncle Tom", "the 1%", "Barbie" "not Palestinian enough" "Wall Street politicians" "not black enough" "sell-outs", etc. People have been documenting her disruptions, and her campaign of misinformation, and instigations. She also has a documented history online of defamatory, divisive and disruptive behavior within the LGBT (esp. transgender) communities. Her disruptions have made it hard to have constructive conversations and productive resolutions to conflicts in a variety of forums in the past several days. At this point we have lost the support of allies in the Community Board, and the State Senator and city electeds who have been fighting the city to stave off our eviction, get us toilets, etc. On Tuesday is a Community Board vote, which will be packed with media cameras and community members with real grievances. We have sadly demonstrated to them that we are unable to collectively 1) keep our space and surrounding areas clean and sanitary, 2) keep the park safe, 3) deal with internal conflict and enforce the Good Neighbor Policy that was passed by the General Assembly. Whether or not you personally feel that the support of the community board and local residents and their reps is needed to maintain our occupation, many of us believe that maintaining Liberty Square (aka Zuccotti Park) as a flagship and nerve center for our movement right now is in fact critical to our efforts that are much bigger picture, longer term, more revolutionary than the internal conflicts that are consuming too much energy right now. We need to take this seriously, and be clear that if we can't deal with conflict and self-organizing then we are facing eviction very soon (this week), and the allies that helped turn out mass numbers at the last one will not be around this time, nor will the press be supportive. Additionally, Bloomberg released a statement a few days ago that said that he / the City plans to crack down on any violations as of this week. Once we lose community and ally support at Tuesday's vote, the door is wide open for an eviction. What to do? We need an all hands-on-deck clean-up and everyone sharing responsibility for the Good Neighbor Policy, including enforcement of 12-2pm and 4-6pm drumming hours. (While recognizing that the community board has been firm that they can only support 2 hrs/day of drumming). We should also start serious conversations internally about what this movement might I look like without Zuccotti Park / Liberty Square. How can we set ourselves up for continued organizing and momentum without an active occupation? I don't write this to be dramatic, it's a serious question. If so much of our organizing time currently (for many of us, 20 hrs a day) is going to putting out fires and maintaining the space, what does it look like if we lose the space? That same night the call went out "supporters needed at Zuccotti Park to enforce Good Neighbor Policy" saying they desperately needed people to come and help them stop the drummers. At the Occupy Wall St. general assembly that night, the group of drummer-protesters organized as Pulse agreed to limit their drumming to four hours a day. The community board had been asking for a two hour limit. On Wednesday night, an open conflict with the community board was adverted that might have given the NYPD the excuse they need, when the CB agreed to settle for the four hour limit. The problem for Occupy Wall St. now is that many of the drummers are not with Pulse, don't come to GA's, and don't recognize any limits. If the occupations can't find better ways to control what is done under its banner, it they will meet with an untimely end. However, there is reason for optimism. In L.A., a wonderful thing happen with the drummers Saturday night. Friday night, when we showed the first film in our Occupy LA film series, the drummers were so loud it was hard to hear the movie. That, plus the fact that the GA ended so late, was the reason we put off showing my film Vietnam: American Holocaust, until Saturday after the GA.
Saturday the GA ended on time, but still there was the problem with the drummers so Tyrone had the movie volume turned up loud so that we could hear. Then the drummers seemed to get louder so Tyrone turned up the volume more. For a while it felt like a struggle between the movie and the drum circle which called into question the ability to even show films or do anything that required relative quiet. Then about 30 minutes into the movie, the drum circle got quiet. They had moved down to the corner. As far as I know, nobody talked to them (from the movie), they just resolved the conflict by moving the drum circle. Obviously moving the movie would have been extremely difficult once it had already started. And in spite of these and other "growing pains," the occupation movement in Southern California continues to expand with OccupyUSC, Occupy LAUSD, Occupy Venice, Occupy Longbeach, Occupy Riverside, Occupy San Diego, Occupy Pasadena and Occupy OC all coming to life in the past few weeks. 20-year-old Benjamin Anderson Harris and 28-year-old Benjamin Burson were charged with Criminal Trespass in the Second Degree and Interfering with a Police Officer. They were arrested prior to the arrest of the 25 people seated in Jamison Square. The 25 people peacefully arrested sitting in Jamison Square Park were charged with Interfering with a Police Officer, Criminal Trespass in the Second Degree and Disorderly Conduct in the Second Degree. Numerous noise complaints from area residents were called into the Bureau of Emergency Communications (BOEC) throughout the evening. The arrests were made after the 25 refused to leave the park after several instructions to leave the park were given by police and Park Rangers. Jamison Square Park closes at 12:00 a.m. In Los Angeles, things are getting better. The disruption and turmoil surrounding the recent general assemblies have served to bring the some important contradiction to the force so now they are being worked on from all sides. On Monday, the general assembly was finally able to gain consensus for a procedure change that allows proposals to be passed with a 90% vote. 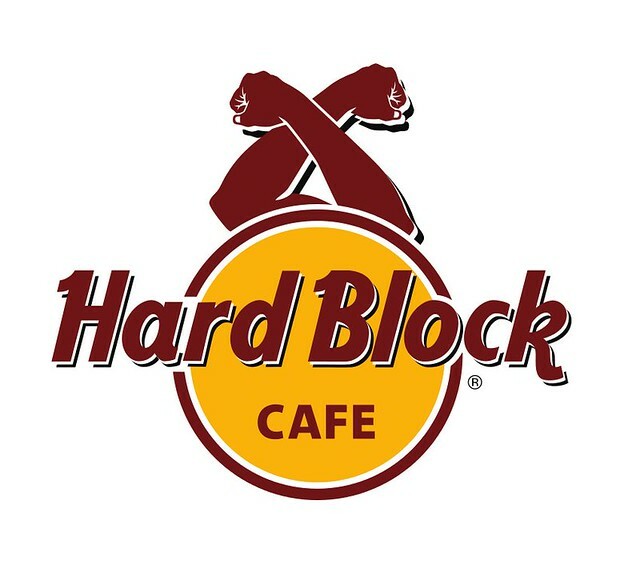 This was hard to get because it required a 100% vote but now that it is in place, it should go a long way towards mitigating the "hard block" problem. A new occupier's march and general assembly has been organized which combines an 8:00am local march and protest with a 9:00am occupiers general assembly designed to deal with some of the practical and most pressing problems of the encampment. The first thing they are considering is a code of conduct and methods of enforcement. Steven and the occupiers with the Keeping It Real Affinity Group have started their own "People's Assembly" in which they are experimenting with a more informal format. While their efforts are largely in revolt against the general assembly, the continue to participate in the GA and discussions continue on how to unify the efforts. Training and planning for what to do when the police come in is starting to move although the LAPD and the city are saying they have no plans to move us anytime soon.